story by Marisa McClellanFor years, yeast was a mystery to me. Though I grew up in a household that made its own granola each week, and canned jams and applesauce every summer, we relied exclusively on store-bought breads, bagels and pizzas. Not until I lived on my own did I start teaching myself more about yeast and the miraculous things it can do. If you’ve never attempted a recipe with yeast at home, this flatbread dough is a really easy way to get started. Once mastered, you’ll find yourself stirring it together a couple of times a week and heaping any combination of seasonal tidbits on top. Best of all, you can freeze portions and pull them out on busy nights for quick dinners. For toppings, simply turn to your local farmers market for inspiration. Spring is in full swing and summer is just around the corner. I like pairing caramelized onions with goat cheese, springy peas with curly garlic scapes and, for dessert, strawberry jam and mascarpone. Add a salad of baby lettuces and dinner is served. Marisa McClellan is a food writer, canning teacher and dedicated farmers market shopper who lives in Center City. Find more of her food (all cooked in her 80-square-foot kitchen) at her blog, foodinjars.com. In the bowl of a stand mixer, combine hot water, yeast and honey. Let sit for five minutes, until the yeast gets foamy. Add flours, salt and olive oil. Fix mixer with the dough hook and mix for three to four minutes, until the dough forms a smooth ball (can also be mixed by hand). Drizzle a bit of olive oil over the dough and smooth over top. Cover the bowl with a piece of plastic wrap and set in a warm, draft-free spot for an hour. Once dough has doubled in size, divide into three equal-sized pieces. Pour a small drizzle of olive oil on a cookie sheet and rub around to coat. Stretch the dough out on the greased cookie sheet. Top using one of the following recipes. Combine the peas, almonds, garlic scapes, two tablespoons parmesan cheese, lemon juice and lemon zest in a blender. Pulse a few times to combine. Then, with the motor running on low, stream the oil and blend until it’s achieved a smooth, uniform consistency. Spread prepared flatbread dough with the pesto. Sprinkle remaining parmesan cheese over top. Bake for 10 to 12 minutes. Remove from oven and scatter arugula over top. Finish with a drizzle of olive oil and a few shavings of parmesan cheese (optional). 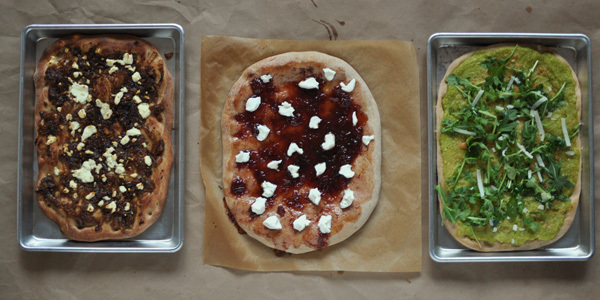 Spread prepared flatbread dough with strawberry jam. Evenly sprinkle lemon zest and black pepper over top. Bake for 10 to 12 minutes, until crust puffs and turns brown. When finished, remove from oven and dollop mascarpone over top. Melt butter in a skillet over medium-high heat. Once melted, add onions, rosemary, sugar, salt and pepper. Reduce heat to medium and cook, stirring regularly, until the onions have reduced in volume by more than half and are deeply brown and caramelized. Spread prepared flatbread dough with the caramelized onions. Dollop the goat cheese over the onions. Bake for 10 to 12 minutes, until the cheese bubbles and the edges of the crust turn golden brown.